The Fraxel SR750 is the most affordable system from the acclaimed Fraxel line and it delivers excellent results for fractional skin resurfacing. 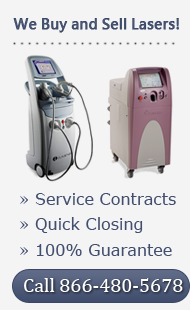 The Fraxel SR750 system is an easy-to-use fractional laser that can handle a variety of skin procedures. It features a fully articulated arm with an ergonomic handpiece that makes treatments easier on both patients and operators. It delivers up to 2,000 MTZs per second and it has Fraxel’s exclusive Intelligent Optical Tracking System for consistent results each and every time. This machine has been proven as one of the safest on the market and it will not fire unless the handpiece is in direct contact with the skin. When you are making your cosmetic laser buying decision, you should also consider the Fraxel SR1500, which is the next generation of this model from Fraxel. To get the best price on a Fraxel SR750, contact UsedCosmetic.com right now. The Fraxel SR750 is an affordable cosmetic laser machine, and it’s even more affordable at UsedCosmetic.com. We offer the best prices on pre-owned cosmetic equipment, but that doesn’t mean you are giving up anything when it comes to quality and reliability. We only sell professionally reconditioned systems that meet our high standards, plus we offer a full satisfaction guarantee with every system we sell. If you need a fast price quote on a Fraxel SR750 system, just fill out the form below and we’ll send you pricing details with no obligation at all. Even if you are just comparing cosmetic lasers and need some guidance in picking the right model, we are here to help and answer all your questions.